St. James Outreach Committee supports many local community organizations, as well as national and international charities. Monthly community dinners are held in the Good Shepherd Hall (54 Beckwith Street) from 4:30 to 6 pm on the 2nd Saturday of each month. These dinners are the church's outreach to the local community in providing a meal to individuals from all social levels. 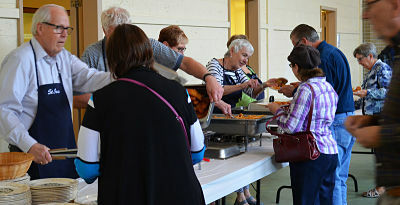 These delicious meals are free and provide an opportunity for social interaction for all Perth and area residents. St. James also supports the St. James Skate Church Ministry, The Guatemala Stove Project, Primate's World Relief Development Fund, The Table Community Food Centre, collecting stamps for effect: hope (The Leprosy Mission Canada), and collecting used eyeglasses for the Lions Club.